Having supplied Kalsec Europe Ltd with a panel & pole self build exhibition stand back in 2005, GGS were delighted when they were asked over to discuss the options for moving things to the next level for Kalsec’s forthcoming exhibition in November – FIE 2013 in Frankfurt. Wanting to ‘up their game’ at the exhibition, and reinforce their brand position as the number one producer of Natural Colours & Flavour Extracts, Antioxidants, Hop Extracts and Nutritional Ingredients in Europe, for the food and beverage industry, it was considered vital to have a clean, modern, professionally constructed eye catching stand. Having listened to and considered all the requirements, we were delighted that our first design visual ticked all the boxes (with a few tweaks) – and came in on budget, so we were then given the go ahead to proceed. 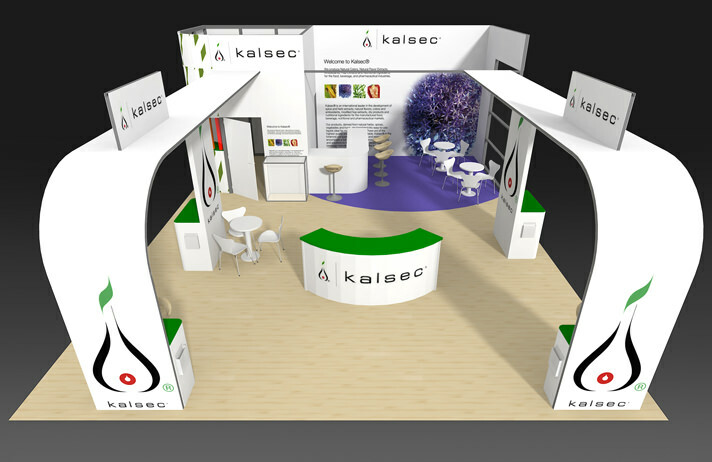 The custom modular 80 sq meter hire stand, flooring, furniture and lighting will be delivered and installed by the GGS team in November ’13 – leaving the Kalsec sales team ‘this time’ feeling fresh and ready for the show. Want to know more about eye-catching stand design? No problem, just email [email protected] with your project ideas and we’ll be happy to discuss them with you.